A woody climber which can become quite rampant. The simple, alternate leaves range from 12 to 24 cm long; some flat glands usually visible on the lower surface particularly near the base of the leaves. 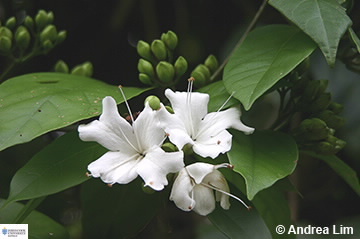 Flowers are borne in clusters, fragrant, corolla-tube to 4 cm long, lobes to 2 cm long, white, ovary with 4 carpels. Fruit creamish-white resembles four small potatoes, although it usually found fragmented into the individual nutlets, 6-10 cm diameter.